It is 9:00 am on Sunday 26th October and I am standing in Asia for the first time in my life. Asia looks like a big bridge. 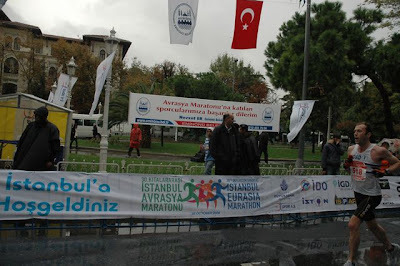 It is the start of the Istanbul Marathon, and it has been raining hard for twelve hours, during most of which I lay in bed and listened to the rain and wished I'd brought something more to wear than my Cambridge and Coleridge vest. I imagined myself being carted to an Istanbul hospital for hypothermia, and wondered if I'd need to pay the ambulance cash. It was raining hard, and it would rain hard all day. I stood at the start line in my vest, gloves and a woolly hat facing the Bosphorous Bridge (seen below in much better weather, the longest suspension bridge in the world). The weeks of preparation had been the best of times and the worst of times. At one speed training session at Jesus Green, where us oldies at the running club had doubled up with the glorious, muscular, lycra-d and confident track-based youngsters, I discovered that I was faster than most of them provided we were doing endless multiple-kilometre repetitions. They're good for 200m, but the years tell over the longer distances. It was a confidence-building moment. And on 12 October I had set a new half-marathon Persona Best of 1:21:36 at the Great Easter Run, scooping a part in the second men's team prize at the same time (last year we won the third men's team prize). It was the first PB of the year, and I had run with my head high. And then it all went wrong. A few days before the race I started showing cold symptoms. I weighed in at 3 kg over my best weight. And then, on the Thursday night, the day before flying to Turkey, I went out for a final run -- 2k slow, 2k at race pace, and 2k slow -- and turned my ankle. Instead of icing it up I had to catch a train to London to go to the Esquire James Bond party. On Friday I was limping and couldn't lift my suitcase without pain. Over the next two days I consumed about half a kilogram of ibuprofen. On Saturday I limp around the exhibition hall and through the Spice Bazaar. And then it got worse. Though on the night before I do manage to persuade the restaurant to give me some rice with the grilled meat, I realise that breakfast in the hotel starts half an hour after I need to leave for the race start. There will, of course, be no porridge for me on Sunday morning. So I go to a cafe and buy a bowl of rice pudding and put it in the hotel room fridge. Then through Saturday night I lie awake and hear the rain blow in. It rains hard. It rains torrentially. I think about hypothermia and ambulances. Eventually I get up, eat my rice pudding - delicious and creamy, but there's not much rice in there - and head off to Hagia Sophia square with an umbrella, to catch the bus to Asia. There the buses are, lined up mainly for overseas competitors: this is the only well-organised part of the race. When the buses arrive a mile or two from the start at 8:00 am we are told to get off. It's raining very hard, thrumming on the roof. There's no sheltered area, and we can see that it's a long way to the start. Almost everyone refuses. Then the police car that is blocking the bus moves off, and the bus unexpectedly starts up and moves closer to the start. This happens another four times. Conversations break out in many broken European languages throughout the bus. Russian, English, French, German, Italian. Eventually we find ourselves quite close to the start. Where there don't seem to be any toilets. At 8:50 I get off the bus, pee over the edge where the bridge starts, and stand freezing at the start. I forgot to bring a bag to shelter under. There is no effort to sift the swift from the slow, except the elite have their own pen at the front. I look enviously. I will beat some of them. My left ankle, the twisted one, is utterly inflexible. I wonder how long it's going to last. It feels like my foot is welded to my shin. It is a shocking race. Twenty-six miles of puddles, floods and sheet water. All around strong men (and there are few women, though more than in the exclusively Turkish male photograph that's part of the poster for the event, overlooking the consistent wins of Ethiopians and Kenyans) break. They peel off. Some probably drown. At one point I run through three inches of standing water under a bridge that turn out to be overflow from a sewer. And it is not flat. "Mostly flat" said the website, lacking an elevation profile. It was not. Most of it may have been mostly flat, but the rest of it, and much of the mostly flat bits, is hilly. Some of those hills are long and slow, some short and sharp. There are some human moments. At one point I pass in turn a German who had passed me on the first bridge, and a short Turkish man who is chasing him. Running up the long hill to the viaduct the latter accelerated, dragging the German with him. I had a plan to be the first western European, and I am not going to let this twenty-something get in my way. He doesn't. He drifts back. I will see him half an hour or more after I finish, dragging himself up the mean finish of all mean finishes. But the Turk, who is about 5'2", passes me. Then I pass him on the downhill. Then he catches up, and slips an inch in front of me, moving over so his should is almost touching mine, an aggressive stance. Our arms brush, and he turns to me ... with a huge smile. He sticks his thumb up. And then falls back, ever so quickly, so that within a hundred metres he's lost. I'm glad he enjoyed the moment, because I think the next fourteen miles were a disappointment. After the bridge, the course takes you through through the Besiktas and Karakoy regions before you cross the Galata bridge just short of 10k. By this point my left ankle feels normal, and I realise that I'm probably not going to catch hypothermia, at least while I'm still running. Someone calls out and cheers me on there -- she was quite fetching, actually, and I can't tell you how glad I was that she was there -- but then I have to wait another 20k before anyone else cheers. There's no applause and no calling out of names. In fact there are no crowds and little support at all, apart from a few lonely souls in shop doorways and bus shelters watching the rain. 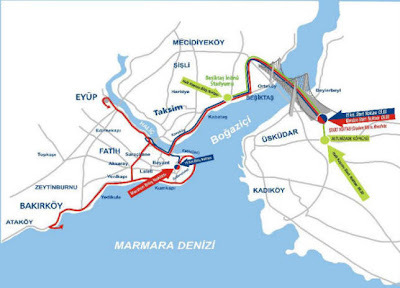 We turn right and run 6k along the Golden Horn to Eyüp before doubling back, cut across Fatih, which is where some of the grim hills greet us, hit the Marmara sea, and run for about 10k into Bakirköy before doubling back again. The weather doesn't improve, but the turn makes things easier, because you know that you're heading towards the finish. I set out for Istanbul targetting 2:52. I set out that morning hoping not to catch hypothermia. I run the first half in 1:28. All is not lost with a good negative split, but it's hard to see how I could speed up that much in the second half. The hills and riptides of sheetwater in the road see to that. Throughout the second half I pass other runner, one by one, with wide spaces between. It's lonely and there's no one to race, just the occasional broken runner decelerating into the gathering wind. I try to keep at my target 4:05 pace, but keep on drifting down to 4:15s. It is a struggle. But down in that core protected from the wind and the rain I feel proud at the effort I'm still making. Around the 30k mark someone calls my name. I'm bruised and beaten by this time, and it takes me a second to realise that something odd has happened. I'm in a remote area of apartment-block Istanbul and someone has pronounced my name correctly. Then she calls out "Cambridge and Coleridge, go Cambridge and Coleridge". I smile and wave. I have no idea of who she was, but I am grateful. Even though the finish line is only 10k or so ahead, I am finding it hard to keep up the 4.05 pace. I know that 2.52 is out of my reach, but can't do the maths to figure out where I really stand. And there's no one to race against. It's lonely. No one is pushing me. The people I pass put up no resistance, but despondently watch me go by. Even the elite African woman, despondently holding on. I'm on my own. And then I remember the Round Norfolk Relay. If you can run the twenty miles from Scole to Thetford on your own in the middle of the night, then this must be manageable. The RNR is specific training for this guts-out anti-clement masochism. Then the angels descend. 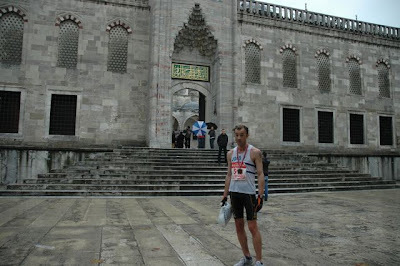 About 2k from the finish line I hear the call to prayer at the Blue Mosque, and know that as the call-and-response wind up, spiralling down from the high pitches, I will be approaching the finish line. The final hills are shocking. Worst of all, five hundred metres from the end there's a hugely stiff uphill, too steep to descend in heels even when it's dry. But it leads you up past the Hagia Sophia and the Blue Mosque to the Hippodrome, what's left of a C6th AD athletic stadium, with a 3500 year old obelisk in the middle. At least the last 200m are flat. The Muezzin sings. The universe fractures. There will never be an experience like this again: running from Asia to Europe through an unremitting downpour to the soundtrack of an ethereal call to prayer. The clock says 2:59. My time will turn out to be 2.58.57. The pictures show my shoulders tight even as I pump my arms. The finish line is like daylight. The organisation at the end is as choatic as you might have predicted, but let me leave that for now .. eventually I locate my kit bag ... at least no one tried to sell me a kilim or bargain over the contents of the goody bag. The medal - you can see it as I stand by the side door of the Blue Mosque - is two sided, in Turkish on one, English on the other. My breath returns with suprising speed. That's an extraordinary sensation, that no one to my knowledge has ever written about - the way that after the finish the air in your lungs swiftly and smoothly becomes enough, and a recalcitrant ease settles on your shoulders as the film over your eyes thins. Someone should write something about that. 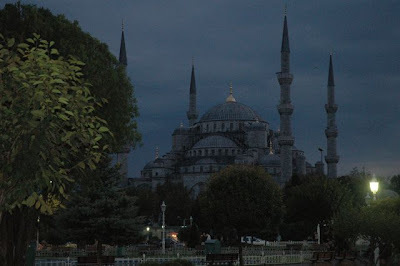 It would rain all day, as I walked around the Blue Mosque and the Hagia Sophia. I drank a blueberry margarita at the Four Seasons Hotel as a pianist played. I drank some bad wine. In my heart I was content. The following morning I went to a Turkish Baths, where my scrubber/masseur massaged my stomach crying 'shish-kebab', and my calves crying 'maraton', as the water dripped from the high marble dome onto the warm marble plinth where I lay. I walked and walked, through the Mosque and Tomb of Suleiman the Magnificent, and snake around the Grand Bazaar, where I am fed apple tea and coffee by many merchants, sitting on stools in bright, busy shops, as we talk around the issue of money. I get the results at home. I knew that my 2.59 ish was a true effort, perhaps better even than my PBs in NYC and then Berlin. The official results may confirm this. I came 33rd. No one older than me beat me. The one man, a Turk, who passed me and stayed ahead during the entire marathon -- this happened just before the half-way point -- finished 24 seconds ahead of me and was first veteran. Once again, strange fortunes, I was second vet. One other western European was in front, hence I was thwarted in my other target of being the first. It seems a shame to reproduce poetry to numbers. What matters is the line that reaches from Asia, through rain and the splash of waters over the ankles, to an ancient stadium and the Muezzin's song, one sense collapsed into the other. Love your telling of this. Beautiful. And congrats on running a great race.